If you wanted to examine the fulcrum on which the "axis of cultural authority" tilted from East to West in the mid-’60s, the Slant Step would be a good place to start. Though it ranks no more than a footnote, it is to Bay Area art what Duchamp’s Fountain is to art history: a kind of crucible. It began as an anti-art oddity — a joke, almost — and over time it acquired cult status, largely because of the reputations of its progenitors, William T. Wiley and Bruce Nauman. 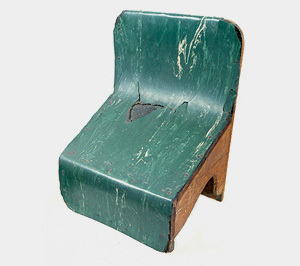 Like Duchamp’s urinal, the Slant Step is an unremarkable object: a cantilevered wood box covered with green linoleum – a piece of junk, really, that many surmise began life as a badly designed footrest. It was purchased in 1965 by Wiley at salvage shop in Mill Valley for 50 cents and given to Nauman, his student, as a gift. Its uselessness and abject quality embodied exactly the kind neo-Dadaist ethos that Wiley was then propagating as an instructor at UC Davis, and for Nauman it served as a sort of muse, if not a fetish. Flatlanders on the Slant, a tribute, now on view at UC Davis’ Richard L. Nelson Gallery, is that kind of show, too. In it, you’ll find cake, video and boxes with electric lights, along with painting, sculpture, and installations of various sorts. Co-curated by Joy Bertinuson, it features work from 50 past participants in Flatlanders, the biennial exhibition of Sacramento-area artists inaugurated eight years ago in this space by the gallery’s director, Renny Pritikin. Given that the show revisits a historical moment, the only way to assess its value in contemporary terms it is to gauge the degree to which the participants push the spirit of Funk forward without looking derivative, imitative or just plain silly. This means, first and foremost, understanding the joke. About a third the artists clearly don’t get it – which is understandable. (Like a Grateful Dead concert, you really had to be there to make sense of it.) Luckily, the majority of the artists on view here do get the joke, and they play it for all it’s worth, treating the task of re-envisioning the Slant Step with a mixture of reverence, whimsy and wild imagination, which is what I imagine Wiley intended when he set this circus of the absurd in motion nearly half a century ago. 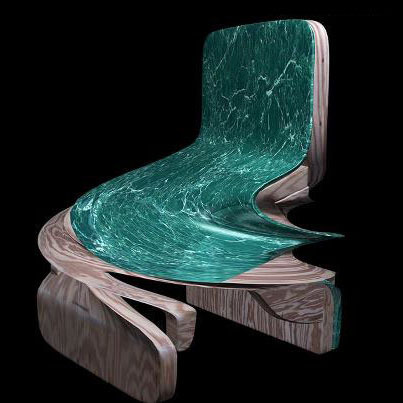 The best works in this show are those in which the artists incorporate the shape seamlessly into their own styles. Appropriately, a life-sized sculpture of Wiley’s greets visitors at the entrance of the gallery. It’s a figure with a dunce cap, and on its body, in the artist’s handwriting, are self-depricating taunts (“Jerk” “Dolt”, Numbskull”) and mock-apocalyptic declarations (“X-spurts Can Save Us”). It sets set the tone – and, perhaps, an unattainably high bar – for what follows. 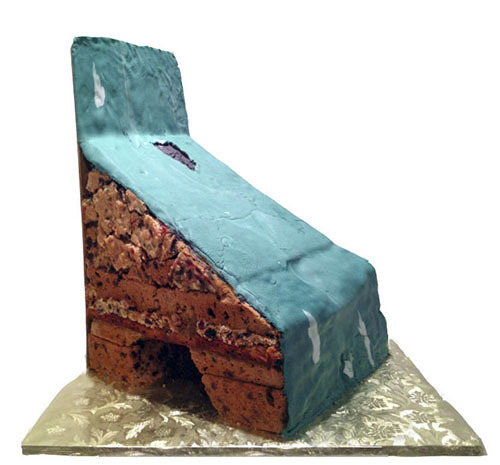 Liv Moe, "Merry Christmas", 2012, fruit cake, 17 x 10 x 10"
Rachel Clarke’s video animation, of a morphing, slant step, issues squeals, groans and shrieks — old-school sound effects (think: The Three Stooges) created by the composer Stephen Blumberg. Synched to the video, they make for laugh-out-loud physical comedy. 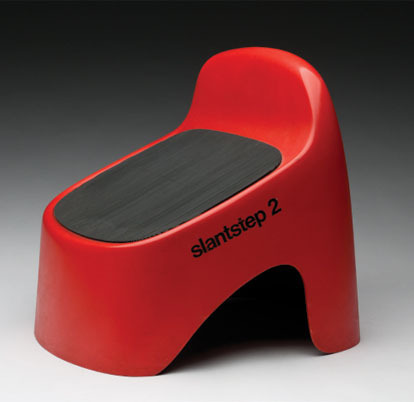 In the role of anti-slant step, Steve Kaltenbach’s industrially fabricated version, from 1969, is pretty funny, too. In a Warholian mode, he turned Funk’s mascot into a cool, sleek, infinitely reproducible consumer item, uniting the criticality of Conceptualism with the reductionist aesthetics of Minimalism. Gale Hart, a painter, designer and sculptor, built a slant step and put it to work as a “grind box” on which skateboarders’ perform gravity-defying maneuvers. The monitor on which the clips play is surround by photos suspended from a steel cable and two skateboards on either side. It’s a shrine to shred whose value rests on its having turned a useless mystery object into a functional prop for yet another cultural phenomenon. Chris Daubert, an artist specializing in perception-bending installations, places glass beads on nylon threads and runs them across the interior of a semi-transparent box that’s lit from below; it yields anamorphic visions of a shape that never fully materializes, a nod to the Zen joke-aspect of the Slant Step’s mystique. Photographer Liv Moe, in the show’s canniest evocation of Wiley’s Dada spirit, submits two fruitcakes, both of which faithfully replicate the size, shape, color and texture of the original. Andrew Connelly, "Tank Slant", 2012, 74 x 21 x 43"
One was consumed at the opening; the other sits in a glass case off the main gallery, a monument to function (edibility) and futility (perishability). Ron Peetz, known for text-driven sculpture that playfully challenges pieties of all sorts, created a Dali-esque installation that pairs a half-melted asphalt slant step with a bent-over “Yield” sign. It’s a clever provocation without clear meaning, and that quality – slipperiness of meaning — may be the Slant Step’s enduring contribution to the postmodern era. Here, it’s instructive to recall that Wiley titled his 2010 survey show at the Berkeley Art Museum, What’s it All Mean? He doesn’t answer the question and neither do the artists here. Abstract painters Gina Werfel, Joan Moment and Tom Monteith certainly don’t; they simply embed the mystery in their works. Werfel’s gestural painting has slant steps circling the canvas as geometric fractures. In Moment’s cosmic-oriented piece, a slant step is consumed in a gaseous white cloud; while in Monteith’s painting we see fragments of a slant step in what look like cross-sections of an archeological dig. Also noteworthy are Andrew Connelly’s glue-spattered slant step (with a half-filled aquarium); Steve Wilson’s found rocks, conjoined to make the requisite shape; a comic drawing from James Albertson and Julia Stagg that shows the Slant Step arriving on Earth in a crashed spacecraft; and Suzanne Adan’s assemblage/drawing in which one of her enigmatic cartoon figures is joined to a Slant Step and surrounded by hundreds of miniscule witticisms — a cryptic marriage of text and texture rendered in an almost indecipherable hand. For those wondering about the beginnings of the Slant Step phenomenon, the original is on view, and it’s in remarkably good shape, considering what it’s been through. It was recently donated to The Nelson, after years spent in the custody of Frank Owen, a retired University of Vermont professor of painting, who acquired it under the auspices of the New York Society for the Protection of the Slant Step. That was after Richard Serra spirited it out of the Berkeley Gallery to New York, after Kaltenbach returned it to California, and after numerous artists shuffled it between backyards, studios and pickup trucks – all rather heedlessly according to a close friend of mine, an artist, who has first-hand knowledge of those events. The artists in this edition of Flatlanders do exactly that. 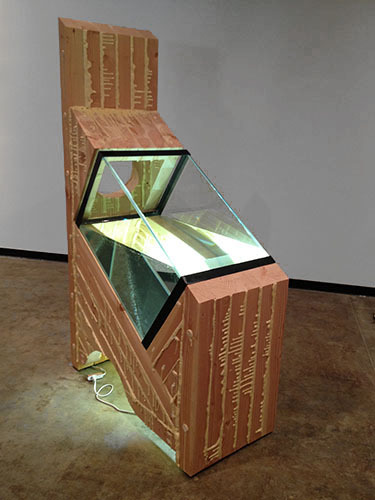 “Flatlanders on the Slant” @ UC Davis’ Richard L. Nelson Gallery through August 17, 2012.